Sustained by its prestigious shareholders, Banco MAIS focuses on providing global innovative and technologically advanced financial and business solutions for companies and private individuals alike. Since 2014, Luis Almeida has acted as President of the Executive Commission (CEO) of Banco MAIS. During this time, he has overseen the bank’s development to full commercial bank and its advancement into digital banking and financial inclusion. Penresa had the pleasure of speaking to him about its recent acquisition by the Chinese Group BISON, as well as the bank’s future prospects and vision. Recently, BISON Group acquired 48% of Banco MAIS shares. What does this acquisition mean for the future of the bank? This was very important for the bank because it has reinforced our balance sheet, giving to the bank more financial capacity to continue its development and access to an international network, especially with China, Hong-Kong, Macau and Portugal, where the BISON has other financial institutions. With this acquisition, Banco MAIS is the only bank in Mozambique with direct Chinese investment and we are changing our strategy to address this market and be the bank for Chinese Companies in Mozambique. We will also start offering other services to our clients, like Investment Banking and Wealth Management. This acquisition shows that it’s possible to attract investment to Mozambique and to the financial system. 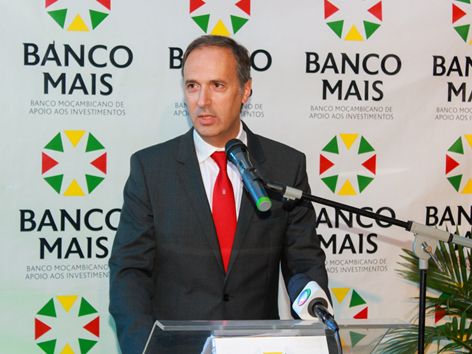 What is Banco MAIS doing to support the development of SMEs? The last years has been very difficult for SMEs, but now the economic environment is changing for the better and there are good prospects for the futures, especially with the start of the gas projects. Banco MAIS has special products and an agreement with the Association of SMEs to support the development and growth of these companies, which is essential if they want to be part of the business opportunities that will arrive soon. Last year, the bank joined the integrated electronic payment system in the South African Development Community. How do you assess the importance of digitalisation in order to increase financial inclusion in the country? Yes, Banco MAIS was one of the first banks in Mozambique to join the SIRESS system. This system brings huge advantages for clients since it’s in real time. I must say that is not only digitalisation that’s important, but all technologies involved in banks that serve clients. Mozambique is a big country, with 801.590 km2 and a low level of infrastructure, so it’s crucial to use technologies to better serve clients and reduce costs. Since 2014, we have decided to invest in technology and we will continue to do so. Now Banco MAIS has a mobile application for clients and we are working with IBM on innovative systems to increase our productiveness and reduce cost. For example, we are using the IBM BPM system on cloud, I think we have been the first bank to use this system on cloud in Africa, that gave us the possibility to have all loan processes digitalised, the decision process on a workflow, the control of all processes and all of this on cloud, meant that we didn’t have to buy any hardware or increase our IT department. Now we are developing new solutions with our partners and with BISON, to introduce new innovative products based on technology. How will Banco MAIS’ certification as Special Operator of the Stock contribute to the development of national companies?